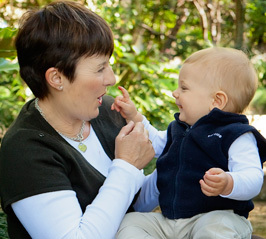 You and all the other adults in your baby's world make up your baby's language environment. Make sure that everyone who is involved in his life is aware how important it is to use detailed expressive language all the times. Direct your conversation to your baby rather than talking while working or with your back turned. He needs to see your eyes and your mouth as well as hear your words. Notice your baby's effort to speak and acknowledge it with a touch or a smile and by repeating what you heard. Children associate words with objects so it is important that they hear the words of the things they are touching. 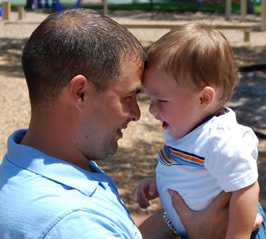 Notice the things that your baby is looking or pointing at and respond by giving him the words that are connected to it. When he points keep providing the word, no matter how many times he wants to hear it. It is not necessary to use ‘baby talk’ or make up a special language of baby words such as ‘horsey’ or ‘doggie’. Your baby can learn the correct words used by adults in conversation just as easily as the baby words so what is the point in giving him a baby word? Doing these things with your baby every day does not require any extra time but it requires you to be patient. Just because you name something once doesn’t mean that your child should be able to say the word for himself next time. It takes time for his mouth to be able to form the right shape to make the necessary sounds. But when you acknowledge his effort and are patient enough to keep repeating words for him gradually he will start to speak.